Reports have have found that the vitamins you can get cheaply at the grocery store may not have ingredients that match the label very well—they may have more, or less, or unlisted fillers. But there’s worse that can happen when you play fast and loose with supplement quality. 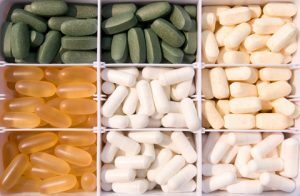 20% of hospital-worthy liver damage comes from supplements (of course, that means the other 80% come from illegal and prescription drugs). What kind of supplements? The kind with big promises for cheap: things marketed to build muscle fast or lose weight quickly (including some green tea extracts). The promises are often built on hidden stimulants or steroids, especially if they’re purchased online for cheap. So how do you avoid these liver damaging supplements? Don’t count on skimping on price and still getting good quality. You might find a bulk or lightning deal, but there’s lots of supplements still getting sold from third world countries with banned ingredients. Look for something with customer reviews, third party accreditations (like the Better Business Bureau) and a stable product/business (not constant label changes—and you shouldn’t have to go three pages into Google looking for a place currently selling it). Once you’ve got a good source, read labels carefully. If you don’t know what something is, and it isn’t clearly explained, Google it. Have you had experience with bad sellers or product? Share in the comments!